Our destination is Makhmur, a Peshmerga camp called “Black Tiger”, 20 miles South of Mosul. Escorted by Peshmerga fighters as we leave Erbil, the capital of Iraqi Kurdistan, we had a bit of time to chat with those fighting ISIS on the front. They proudly show us their Peshmerga identity cards, repeating that they are Peshmerga. It’s impossible not to note their pride and satisfaction at being part of this military elite. “We are Peshmerga, we really fight ISIS, we are also saving also lives,” one soldier said. “Kurdistan or Death!” is one of the many mottos and symbols they wear proudly on their arms. At the base, after having served the usual tea around the fireplace, Brigadier General Serwan Barzani, one of the leaders of Peshmerga, arrives with other military officers. “ISIS fighters quickly change their military technics. There are very well trained soldiers among them, from Chechenia, Egypt, Albania, and also former soldiers of Saddam Hussein’s army,” he said. “There used to be black flags of ISIS here. The Peshmerga forces have liberated all the villages in the area and thanks to the courage of Peshmerga fighters ISIS is being defeated,” General Barzani continued. 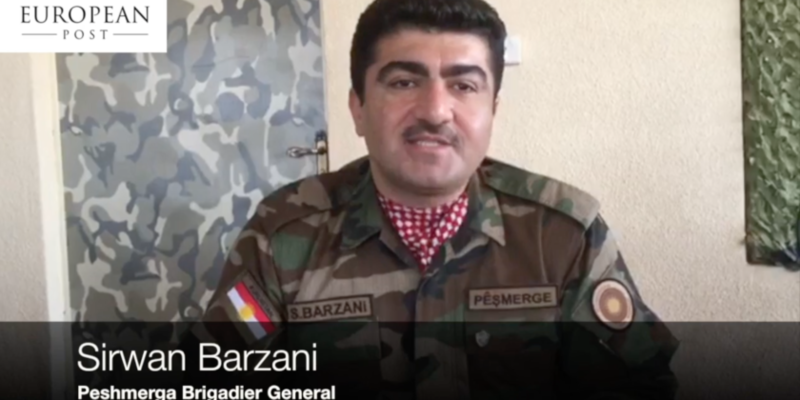 When we ask about the famous Peshmerga woman soldiers, he says that ISIS is scared of them because being killed by a woman means missing ‘the opportunity’ to reach paradise and the virgins promised by the Koran. “Sometimes they simply withdraw without fighting,” he added.